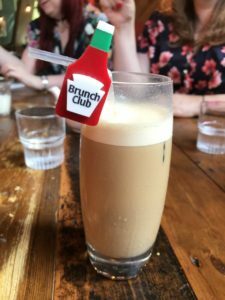 Brunch Club’s sweet sixteen took place on Saturday 26th May 2018 in Canada Water, at Leadbelly’s Bar & Kitchen, Montreal House, Deal Porters Square, London SE16 7AQ. Another high ranking brunch spot on our list of potential options, the brunch menu at Leadbelly’s has something for pretty much all tastes and is 98% gluten free so we went in with high hopes. But… did it deliver? Lori: I went for an iced black Americano (for the coffee hit, but cooler on a warm day). They charge extra for ice though, which is rather odd. Eleanor: As it was warm, I went for an Iced Latte – despite it costing an extra £1 for the icing part. It was good. Lou: Tea! It came in a pot that provided 2.5 cups of solid breakfast, and it was astronomically expensive. But could I get sugar? We had to ask three times for sugar. Lori: I was very excited about this place, as I’d heard they were great for anyone avoiding gluten. I went for the chorizo beans (on gluten free bread) with eggs on top, but sadly the optional black pudding contains wheat (disappointing! ), so I saved myself for the gf waffles instead. 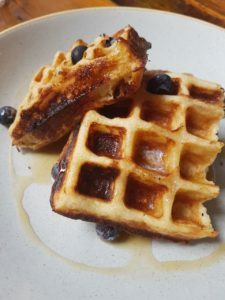 The bread in my ‘main course’ and those buckwheat waffles I had for ‘brunch pudding’ were both fantastic, with a great flavour and texture which is rare in gf options. Very tasty food overall! Ed: I had the Veggie Full English, which was actually very nice, really good seitan sausages, a load of mushrooms (maybe too many?!) a giant round veggie burger sized hashbrown. The sourdough was a little disappointing and rather chewy, but overall the food was fine and the portion was huge. I had the waffles (I shouldn’t have as I was stuffed!) they were pretty standard waffles, a bit stodgy but alright. Eleanor: The Full English. The portion was pretty big: two sausages, a large pile of bacon and a super-size hash brown. My poached eggs were cooked perfectly. The mushrooms were cooked in garlic butter sliced incredibly thinly which meant the texture was different but in a good way! It was a great breakfast and very filling. I had a fresh orange juice (fine) and stole a bit of the waffles – nice, but needed more interesting toppings. 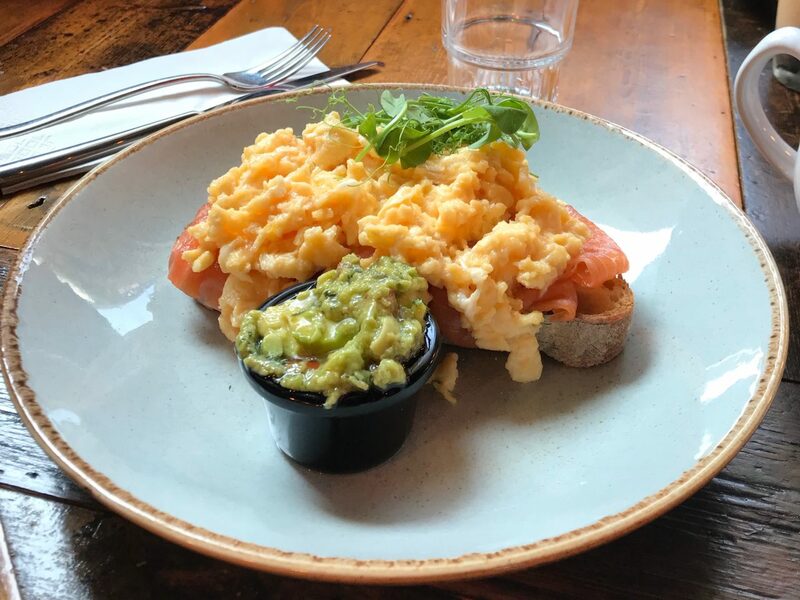 Lou: I went for the salmon, scrambled eggs and got smashed avocado on the side. It was very tasty, and the sourdough the breakfast was on was lovely, but it was not a breakfast to write home about – just solid grub. Lori: Mostly changing jobs and workplace conventions/atmosphere, plus our thoughts on Drag Race s10 e10 and plans for the next Brunch Club. I’m sure there were loads of other things too though, as we chatted for hours! Ed: Sewing, Drag Race, work stuff. Eleanor: Buying patches for clothes, the school trip I went on where the coach set on fire. Lots of work chat. Drag Race, of course. Lou: We also talked about manicures, the history of Canada Water, the beauty of air conditioning on public transport. Lori: The interior of Leadbelly’s is gorgeous – eclectic furniture, bright posters and lots of plants – and the booth we were in could have seated 6 so we had lots of space. The service was a bit slow initially so, although good if you want time to chat, perhaps not great if you’re in a hurry. Ed: Atmosphere was nice seemed very relaxed. I think the relaxed seemed to extend to some of the staff who were slow and very forgetful (we never did get that sugar!) I know it sounds like a silly small thing but when I first walked in (I was late) none of the staff said hello or anything to me as I wandered if looking a bit lost. Same as I exited I walked past a few staff members who didn’t say anything as I was leaving. 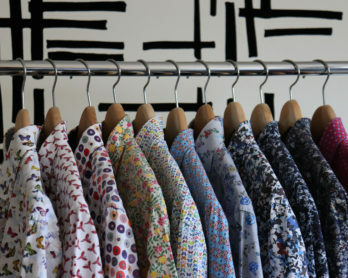 Eleanor: I liked the decor, a bit of mish-mash of lots of different styles but styles I like. 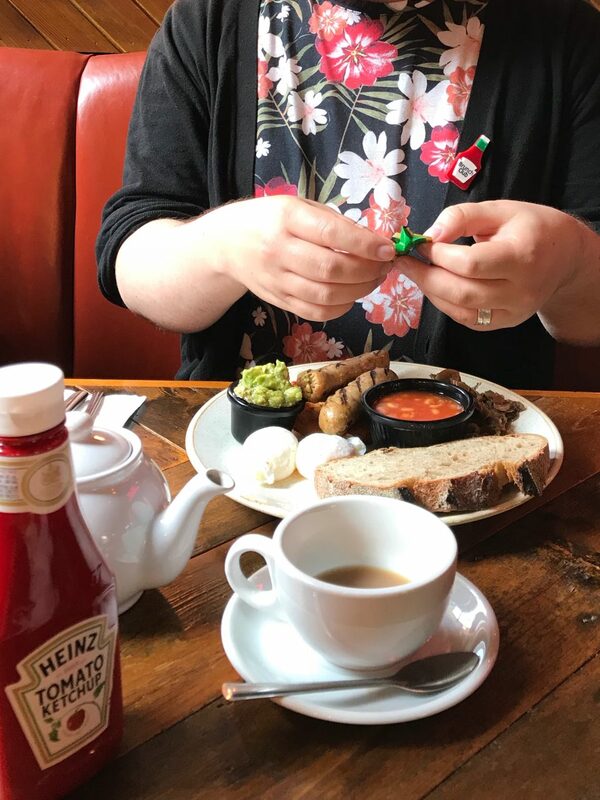 The service was not great – repeated asks for sugar, and slow response times but as we like leisurely brunches it worked. Toilets were lovely, I liked the grey/yellow colour scheme – even with matching drugs notice! We all side-eyed at the girls/boys signage for the toilets. 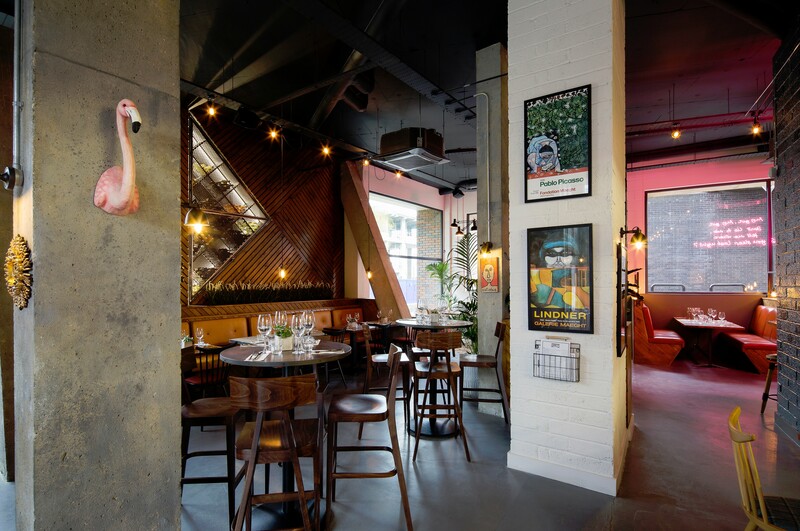 Lou: The restaurant felt very spacious with lots of room, and the outside space was very popular. Loos were down a narrow staircase and I didn’t find an accessible loo, although I am sure they must have one. The table we were on was huge and beautiful. It felt very Pinterest-y. Lori: We all went to the nearby Canada Water shopping centre for a look round The Range. 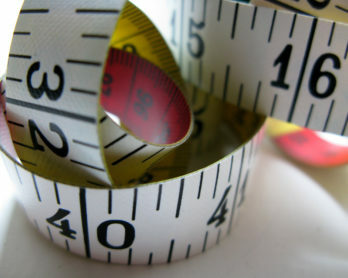 I’d never been before and now feel the need to plan a craft project! Ed: THE RANGE!!! I need to go back to the craft section after payday with a trolley! Eleanor: The Range was an epic as I thought it’d be, need some craft projects! I then had a nap as usual. Lou: I was supposed to head to a party but ended up having a super long Skype call with a friend. 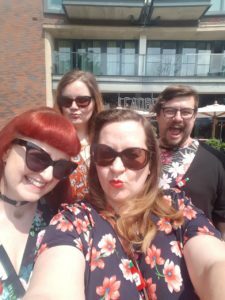 Sunny floral Brunch Club selfie! Lori: Overall, I wouldn’t say it’s an absolute ‘must visit’, but the food was very tasty so worth considering if you’re already in south east London or are specifically looking for gluten free options. Ed: It’s funny how differently we tend to view places when we’re not local! Being a North Londoner, I didn’t feel it was worth travelling to. Totally fine if you have plans nearby elsewhere (perhaps at the nearby Poetry School?!) It was nice enough, the food was generously portioned. I really wasn’t best pleased with the service though. I know this is another thing only I care about but I feel like Leadbelly as a name is not the most appealing for somewhere serving you food, especially if you are avoiding gluten due to its effects on your belly?! Eleanor: An enjoyable spot, it’s good to have local cafes worth a visit. Lou: I was pretty impressed by the range of gluten free and vegan options, and would recommend it if you’re in the area – just don’t ask for sugar. 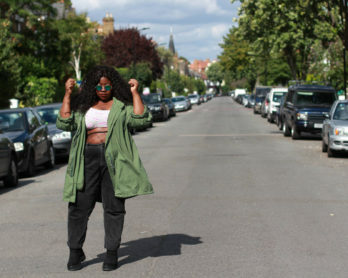 The image of Leadbelly’s at the top of this post is via leadbellysbar.co.uk. 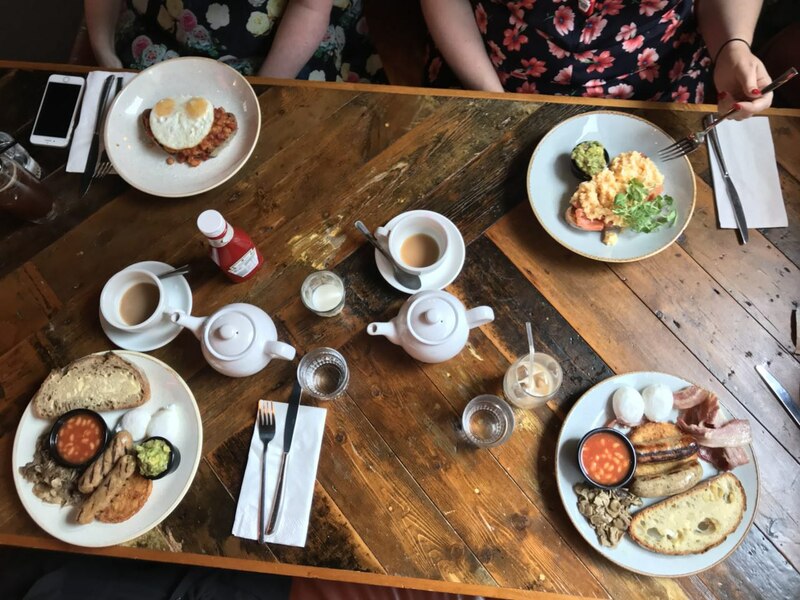 All other images were snapped by Brunch Club members on their phones, so excuse any blurriness as we were all rather excited about eating the food.